The Better Business Bureau is calling the proliferation of fake check scams an "exploding epidemic". Complaints to regulatory agencies and consumer watchdog groups have doubled over the last three years. Scammers have a new tactic and a new target. 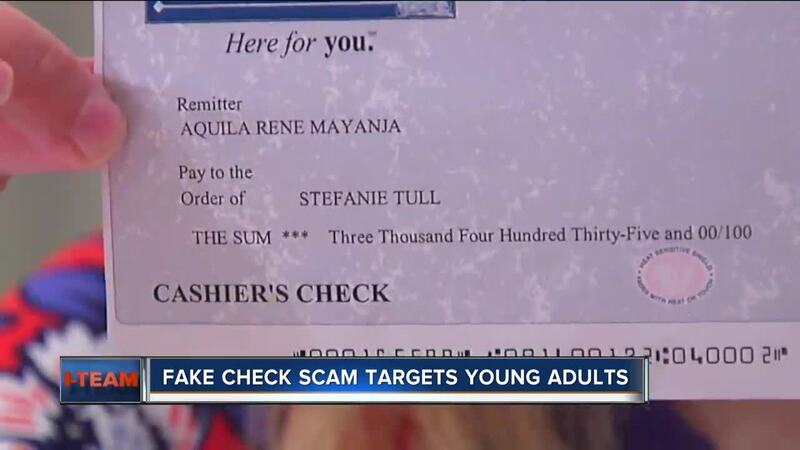 They use fake checks to target not seniors but young adults who have landed a new job. A quick search of the Better Business Bureau's Scam Tracker brings up nearly 4,000 hits for fake check scams. The latest is called the Fake Check/Overpayment Scam. It works by young adults getting a job such as a mystery shopper. The job promises to let them work from home even though they have no experience and get paid thousands of dollars a month. The "employer" mails them a letter along with a legitimate-looking cashier's check. "You're told to deposit this into your bank and take a small portion of it and send it back to (the employer) or send it to a third party," said Jim Temmer of Better Business Bureau Serving Wisconsin. But then the bank calls and says it was a fake cashier's check. "Once your bank finds out that it's a fake check they're coming back to you for that money," Temmer said. For instance, the BBB reports in St. Louis a college student lost hundreds of dollars in a mystery shopper scam using a fake check. The Bureau reports he responded to what appeared to be a professional-looking online job listing for a mystery shopper. He was then sent a cashier's check for almost $2,000. Per instructions, the Bureau says the student deposited the check, "mystery shopped" several businesses, and sent $885 to two addresses. His bank later informed him the $2,000 check was not valid and he would have to repay the bank the $885 he sent. "People need to understand fake check scams in order to protect themselves," said Temmer. "In particular, fake check scammers rely on misunderstandings about checking in order to trap their victims. In order to comply with federal regulations, banks often release the hold on a deposited check before they can verify that the check is valid. If the check turns out to be invalid, consumers are required to repay the bank." The BBB reports that scammers prey on feelings. "You won the lottery," said Temmer. "Your grandson is in jail. Whatever it is they're relying on you to think emotionally and not with your head and that's how you get scammed." Temmer recommends verifying the legitimacy with the check's issuer before accepting it. Does the check paper feel flimsy or different than a usual check? If the check looks and feels legitimate and you fall victim, report it to the BBB. "The more people who report them the more information we can get out there to empower people to keep their money safe and not fall for these scams," Temmer said. The bottom line is that old adage: if it seems too good to be true, it probably is. To see what kind of scams are prevalent in your area visit the BBB Scam Tracker.